Published in Rafu Shimpo, October 10 , 1958. 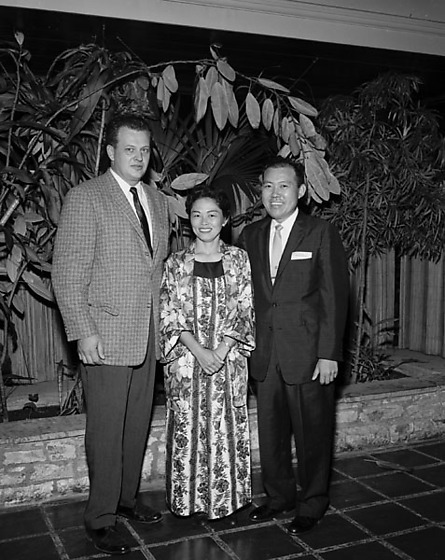 George Izumi stands beside Mrs. Lucille Kusagaki Parks of Liliha Bakery in Honolulu and Master Bakers Retailers Association president Frank Plusko at awards dinner of the 2nd annual "Ideas for Bakers" show held at the Los Angeles Breakfast Club in Los Angeles, California, October 10, 1958. 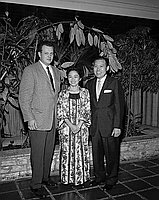 Izumi, smiling man in dark suit and light necktie, stands at right on tile walkway beside a smiling woman in a long floral patterned dress, center, and a tall Caucasian man in plaid jacket, left. Low stone wall and trees in background. Typed on original negative envelope: George Izumi -- Bakery Award Dinner at Los Angeles Breaskfast Club. Izumi won 6 out of 12 entry classifications in the "Ideas for Bakers" show. He organized the first show the previous year.